Hill Gallery (708 N Robinson St) will be holding an opening reception to benefit A.R.T. in RVA (Artistic Realization Technologies in Richmond, VA) on Tuesday, March 25th from 5-8 PM. 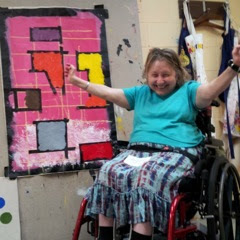 This program provides an opportunity for individuals confined to wheelchairs to express their insight, emotion and experience through art, resulting in powerful and vivid artistic expression. The original Artistic Realization Technologies (A.R.T.) program was founded by artist Tim Lefens in 1995 after witnessing the power artistic expression can have for those with physical disabilities. Mr. Lefens provided guidance and coordinated training for the startup of the Richmond-based A.R.T. program. The goal of this program is to achieve non-profit status and make this program a permanent resource for the physically disabled children and adults in the Richmond metro area. The volunteers of A.R.T. in RVA are proud to carry forward this process of allowing individuals with limited control of their limbs and limited ability to speak the chance to be empowered and express their insight, emotion, and experience on canvas. All of the proceeds will benefit A.R.T. in RVA.